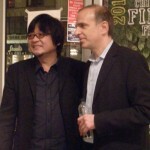 New York International Children’s Film Festival – Opening Night « Asian Culture Goes Pop! I don’t care if you have kids or not, but you really should check out the New York International Children’s Film Festival. It’s fun for the whole family, as well as adults who are kids at heart. 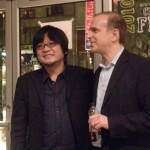 The Opening Night festivities featured Mamoru Hosoda’s, “Summer Wars“, followed by a Q&A session with Hosoda and a reception for everyone. The day began with a massive snow storm in the NYC metro area, but that didn’t stop the NYICFF’s staff and film goers from attending the opening night. 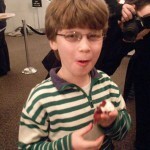 Eric Beckman is the director of the New York International Children’s Film Festival. Here he is giving us a breakdown of this year’s festival. 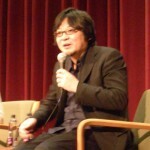 The star of the evening was Mr. Mamoru Hosoda. He directed anime movies for Digimon, One Piece and The Girl Who Leapt Through Time. Mr. Hosoda took time for a Q&A session, taking questions from kids and adults alike. Honestly, I think the kids asked better questions than the adults! 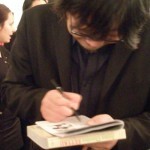 Hosoda-san was more than gracious in taking the time signing autographs for kids as well. 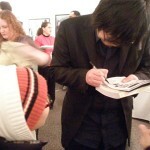 Here he is drawing a figure on a ticket stub for a young girl. The fun doesn’t stop there. Here is Hosoda-san drawing on a paper plate for three boys from the audience! You can also check out NYICFF’s Opening Night festivities in this Gallery. 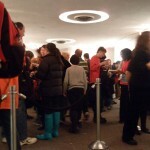 The NYICFF Reception was jam packed!